Traditional folk music sung with harmonies to enthrall you and played on a variety of acoustic instruments including guitars, flute, mandolin, fiddle, hammered dulcimer, banjo, viola, and string bass. Sometimes you just know what you are born to do. That's how it is with "The Holt Twins". Coming from a musical family,(their brother is a professional jazz and concert band percussionist and the rest of the family plays as well..), they have been reading and playing music since the age of 5 and singing harmonies since they were 7 yrs. old. Their professional career began at age 14 and they have been performing ever since at festivals, schools, clubs,campgrounds, and concerts. They are considered Folk artist legends and local celebrities in Berks County where they made their name, and once Linda and Emily hit the road their talents became known across the country. The twins play a wide variety of music and instruments and also write their own songs. 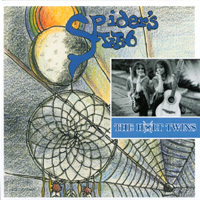 "Spider's Web" is a collection of some of their favorite traditional folk songs arranged with the entrancing harmonies of voices and instruments that Linda and Emiy have always pleased their audiences with.